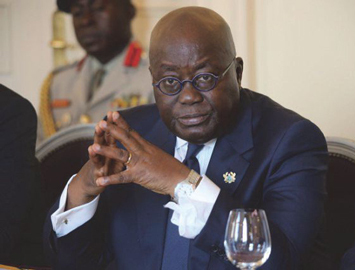 The Oxford Africa Conference and the Oxford Business Network for Africa, earlier this year, was hosted by the Said Business School and featured Ghanaian President Nana Akufo-Addo. “We’ve already lost so much time that we cannot afford a slow period of growth. We have a dynamic restless population that demands and deserves the best of the world. They are not in the mood to wait for the love dividends of progression. As the track across the Sahara vividly illustrates. It has become obvious to us if we continue along the same path that we’ve pursued since independence we’re not likely to achieve the rapid development that we need. The only way we can (is to) generate jobs for our young people and hope for the future. “Ghana is a country that is well endowed with many natural resources, such as gold, bauxite, diamonds, oil, gas, timber, cocoa, water, fertile land. You name it we have it. “Unfortunately, if you take an honest look at the state of our nation you would not know that we have these natural endowments. We are poor, we feel poor and we have huge infrastructure deficits. “The reason is not far to see. Since independence we’ve been stuck with the economic structure defined for our status as a colony. That is the production and export of raw materials, which puts us at the mercy of widely fluctuating commodity prices over which we have no control. And the import of manufactured commodities from the industries of the colonial power which creates wealth and jobs there, but not at home. “This economic structure has been exacerbated by mismanagement, corruption and high fiscal deficits, which have become the hallmarks of our economy, which we finance by borrowing and financial aid. “The foreign aid cushion, especially, has been a debilitating factor in our efforts to develop our country. It saps our self-confidence and undermines the dignity and respect that could propel us to prosperity … (A)id dependency … was never intended to help us develop and stand on our own. It must be clear to all of us that the economic transformation that we aspire to will not come through aid. China’s trade with Africa in 2000 was a mere $10 billion. By 2014 it had risen more than 20 fold to $220 billion according to the China Africa Research Initiative at John Hopkins School of Advanced International Studies, with over $94.4 billion in loans to African governments and state owned enterprises. During the same period its direct investment went from two percent of U.S. levels to 55 percent, with billions of dollars of new investment made each year, according to the Financial Times. China contributes about one-sixth of all lending to Africa. But there is a hidden part of China’s financial relationship with Africa that is rarely documented, that stems from having to go abroad because of limited opportunities in China. Chinese factories have been driven out of China, because of rising cost and many have landed in Africa. In Irene Yuan Sun’s 2017 book, “The Next Factory of the World: How Chinese Investment is Reshaping Africa,” she suggest Chinese factories are a part of the continents future. Yuan Sun questions Western development programs that claims things like educating children, but won’t “create a 100 million jobs and lift a billion people out of poverty.” She writes that by Africa becoming the next “Factory of the World,” the continent can reshape itself from a poor continent into one of the largest economies on the planet. German car make Volkswagen rolled off its first cars built in new assembly plant in Kigali’s Special Economic Zone. “Africa does not need to be a dumping ground for secondhand cars or secondhand anything,’ President Paul Kagame said at the unveiling ceremony. “Some found it hard to believe that German cars could really be built in Rwanda. Yet today, the first vehicles are rolling off the assembly line. This facility undoubtedly represents a new chapter, in Rwanda’s journey of economic transformation,” he added. According to TheEastAfrican, analysts predict that the new vehicles market in Africa could increase rapidly with President Kagame, who is also the chair of the African Union, having joined the campaign to reduce importation of used cars in the continent. The African Union’s home page recently urged member states to step up “anti-corruption” fights and “strengthen their strategies” to fight against corruption. “This year was dedicated to making progress on this issue, and although there are tangible, verifiable achievements with some member countries, much remains to be done, we only call for the necessary policies to be adopted in this regard,” said the AU. This year the AU chair, Rwandan president Paul Kagame, not only spelled out plans for financial independence of the continent-wide body, but is fighting against corruption and making encouraging youth and women empowerment a priority.